Beirut is set to witness a unique exploration of the works of a talented British artist, David Cottingham. “Visions of Dualities” will take place at Villa Paradiso in Gemmayze from the 17 to the 22 of December. This dynamic exhibition of new work reveals the harmony and duality of vibrant colour and intricate rhythm of lines. From mirror image diptychs to paintings and drawings that intermingle, each piece is a potent reflection that showcases movement, nature, patterns, light, life and mythology. This marks VC Art’s second exhibition that showcases David Cottingham’s fresh style. The first was in London and it amassed significant acclaim. In fact VC Art has been behind many successful shows in Beirut, London and Dubai. VC Art represents promising international emerging artists and gives them the space and support they need to grow, develop and progress. Dedicated to making art enjoyable and accessible for all, this latest show celebrates the power of visuals. David Cottingham studied sculpture at St Martin’s School of Art in London with William Tucker, Phillip King RA and Sir Anthony Caro. After graduating, he worked with the figure before eventually returning to his first love: painting and drawing. It took a long time for Cottingham to develop his recognizable style and even now, his art is constantly evolving. This makes this exhibition especially captivating since it captures a turning point in his artistic growth. Cottingham creates art that reflects the subject, the artist, the self and the viewer. These multi-layered reflections are inherent in his iconic Dance Drawings, in his signature Abstract Paintings and also in his Diptych mono prints. The Dance Drawings symbolise the “Dance of Life” that never ends while the Abstract Paintings are inspired by transient light on landscape in a way that captures light in mirrored areas and reflects it back to the viewer. The Diptychs are vibrant images that are linked by accident and designed to create an evocative duplicity. The Dance Drawings are a celebration of the movement of lines while the Abstracts exalt the movement of light. 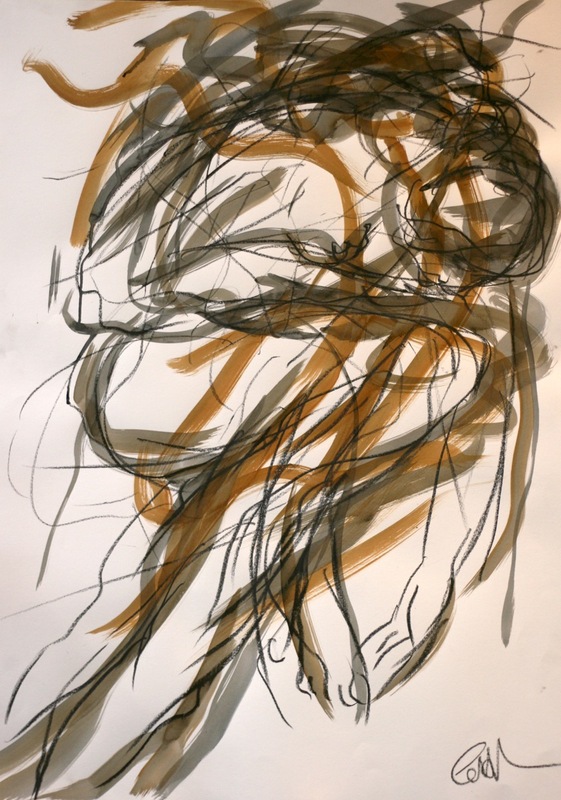 The Dance Drawings and Paintings are real-time studies of contemporary dancers while the Diptych works have figurative elements and can be viewed as cells of colour dividing, separating and also being pulled apart. This collection explores mythology and the beauty of the Mediterranean, making Beirut the ideal place for these artworks to be unveiled for the first time. Two of Cottingham’s masterpieces which have never been exhibited before will also be on display. The large 220cm X 210cm Dance Paintings are stunning narratives of the body feeling imprisoned and almost mechanical in one instance and then liberated and exposed in the other. Bold lines painted in different colours express these fascinating physical states. They are his sculptures on canvas. And to make this exhibition even more special, a magical venue has been selected: Villa Paradiso. This beautiful villa in Gemmayze is a rare traditional Lebanese mansion from the early 20th century. The old walls will contrast with the bright colours of the artworks, making a striking statement and creating a complete experience. The history and nostalgic architectural charm of the villa is a subtle tribute to the duality of past and present.